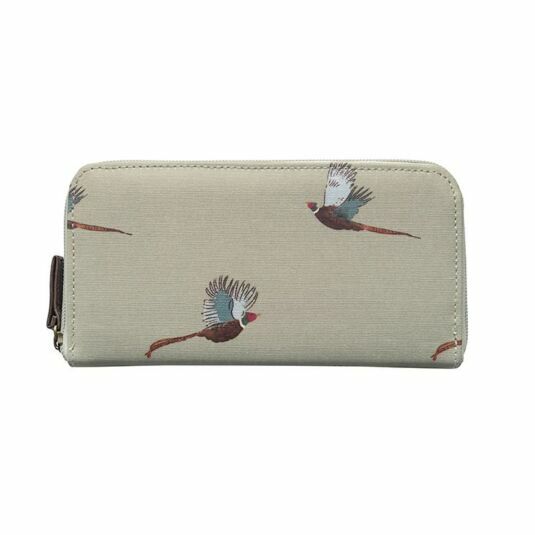 Part of the Pheasant collection by Sophie Allport, this is a practical women's wallet that zips open to reveal six card sections and a secure central zipped compartment for coins. It also has two large areas for notes. 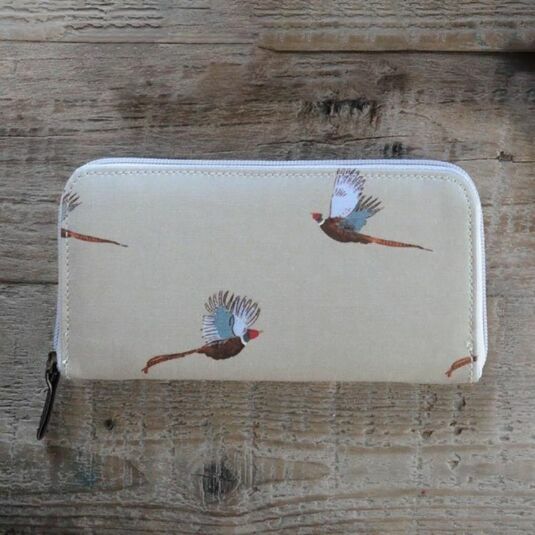 It is made of practical wipe-clean oilcloth from Sophie’s pheasant fabric that features the magnificent long tailed male Pheasant flying across a stone green background. The wallet securely zips with a dark brown leather pull and has a further interior zipped compartment in a mixture of green and cream polka dots and a continuation of the flying pheasant design. With a secure zip fastening and waterproof exterior this is guaranteed to keep your valuable cards and money safe and secure, this would make a fantastic gift for those who love the country, ideal for parents, grandparents or siblings at Christmas, birthdays and mother’s day. A collection of stylish kitchen textiles, oilcloth, tinware and fine bone china, each featuring Sophie Allport’s delightful illustrations. Whether you are an animal lover, or a fan of the great outdoors, there is sure to be a design which you will love.